Product prices and availability are accurate as of 2019-04-24 07:38:43 UTC and are subject to change. Any price and availability information displayed on http://www.amazon.com/ at the time of purchase will apply to the purchase of this product. 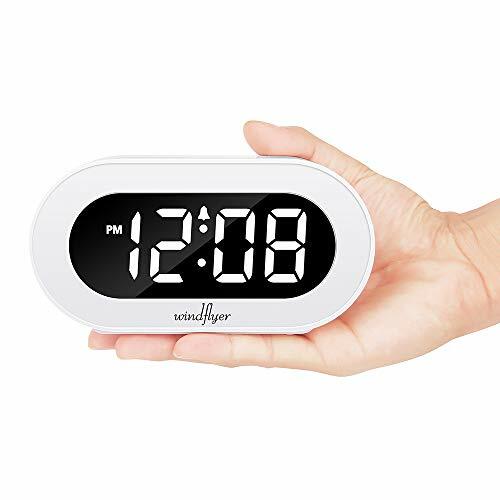 The modern alarm clock is extremely easy to setup; The user-friendly bedside alarm clock with compact size fits for any decoration. Perfect for home, hotel, office, nightstand, shelf and bedroom clock. You can adjust the brightness of the digits to any brightness level that feels comfortable to your eyes. Just move the dimmer slider control on the back, have it bright in the day then dim them down at night. 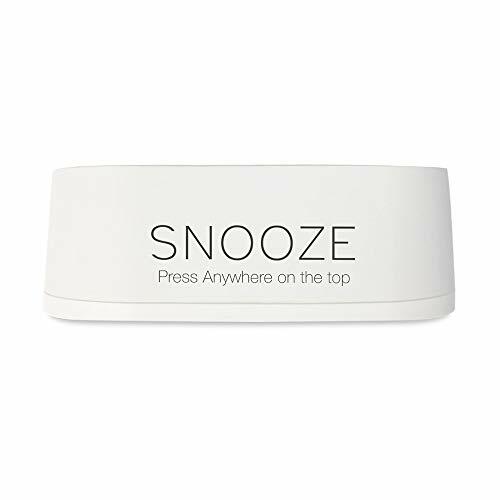 Press anywhere on the top to catch a 10-minute of sleeping. 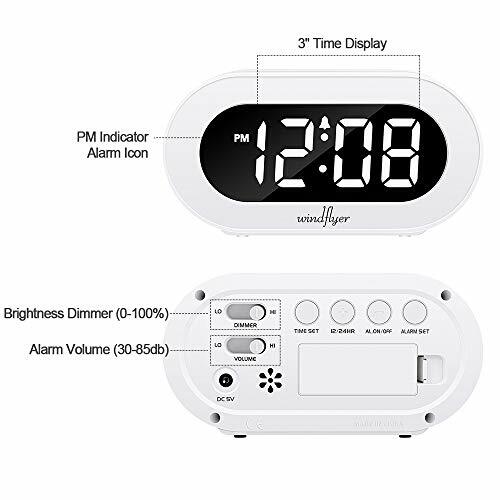 Designed with absolute simplicity in mind, you will feel zero stress to set time and alarm, easy for kids, students, seniors, adults and the elderly. 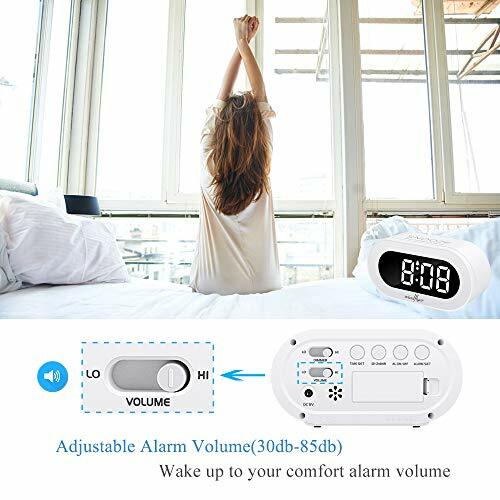 The alarm sound can be adjusted from 30-85db with volume slider according to your personal preference. Plug-in to power the clock with the included USB adapter (100-240V) . The 2AAA battery (not included) are just for maintaining the settings for the time and the alarm during a power outage. During battery backup, the screen goes blank and alarm won't sound. Space-saving (5.6" x 2.9" x 1.9") AC powered, with large white LED numbers easy to read day or night; battery backup saves time during power outage. Please NOTE:It is NOT a battery-powered alarm clock. Easy snooze with a simple press of anywhere on the top. Easy-to-use digital alarm clock. Even no need instructions to operate it. 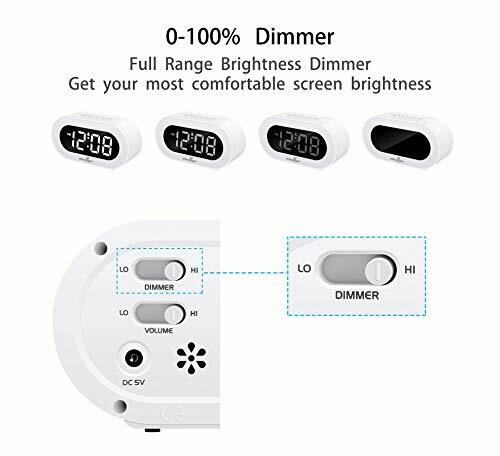 Get your personal comfort brightness with 0-100% dimmer slider, and enjoy a fresh morning with adjustable alarm volume from 30-85db. 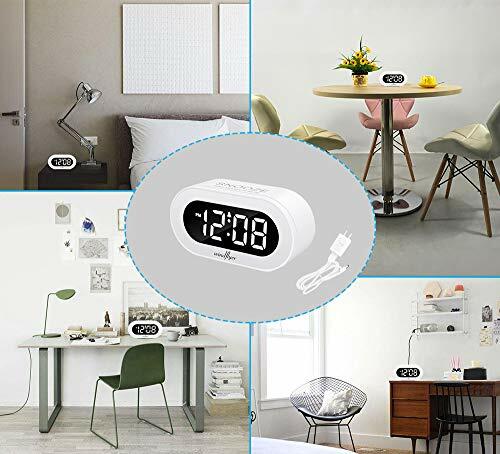 Outlet Powered with Battery Backup : Plug in to power the clock with the included DC adapter . 2* AAA batteries ( not included ) needed for storing time and alarm settings in case of power outage. During the backup battery, the screen will go blank and alarm will not sound.